Today marks the day when exactly 15 years ago the two-month-long Kargil war with Pakistan ended. The war was forced on India after surreptitious Pakistani Army intrusions on the Indian side of the Line of Control were first detected across a 160-km stretch in Kargil district of Jammu and Kashmir in early May 1999, taking the Army and intelligence agencies by surprise. In appointing State Information Commissioners, the Haryana Government followed high court directions of 2011 to advertise such posts and follow a laid-down selection process. Yet, as it turns out, one of the appointments is of a person already granted re-employment as adviser (health) to Chief Minister Hooda for his previous loyalty to him. Another is the wife of Hooda's political adviser, a person who has the CM's ear. CAPT. Petavel has been at work in Calcutta and Bombay to demonstrate a new scheme of self-supporting education. That is to say each boy and girl is to receive a course of practical and useful education under arrangements which include an industrial scheme. This enables each pupil to pay his or her maintenance and cost of education right through and if possible leave a small reserve also to start life with. The recent edicts by the Jathedar of Akal Takht excommunicating three Sikhs of Haryana have not met with much appreciation from Sikhs around the world. Most Sikh institutions respect the sovereignty and sanctity of Akal Takht. They refrain from outright criticism of decisions by the Jathedars. The current decision is causing concern and some are breaking their silence. In fact, there have been calls for the Jathedar to leave this most esteemed of Sikh positions and allow the Panth to select another Jathedar. Predication gets complex when we analyze the relationships of constituents in a variety of sentences. Explaining their structure and relationship at an elementary level, traditional grammar makes a primary distinction between subject and predicate. In the sentence “Rewa exports garments”, the subject (Rewa) is modified by the predicate (exports garments). The verb “exports” is the main element of the predicate, followed by the object “garments”. mein dil mein aata hoon samajh mein nahi...so dare you try to understand it with your dimaag! We won't say leave it behind for there is no way you can sever your brain from your body! set in a fictional Republic of Zubrowka, a European Alpine, The Grand Budapest Hotel is a charming but unusual story of the happenings centered on its glib concierge Monseiuer Gustave H (Ralph Fiennes) and Lobby Boy Zero Moustafa (Tony Revolon). Today marks the day when exactly 15 years ago the two-month-long Kargil war with Pakistan ended. The war was forced on India after surreptitious Pakistani Army intrusions on the Indian side of the Line of Control were first detected across a 160-km stretch in Kargil district of Jammu and Kashmir in early May 1999, taking the Army and intelligence agencies by surprise. The detection led to the Army and the Indian Air Force mounting a major uphill offensive to get the intrusions vacated. In the process, the Army lost over 500 soldiers with over 1,350 wounded. The war was significant for a number of reasons. It occurred at a time when both countries had overtly declared themselves to be nuclear-weapon states and despite the two countries reaching a bilateral agreement aimed at confidence building barely three months earlier. It exposed the untrustworthiness of a military-dominated Pakistan and the dismal performance of the intelligence agencies. It exposed the carelessness of a section of the Army that was entrusted with guarding the frontiers. Then again, during the war, both the Army and the IAF were exposed for their lack of preparedness. Yet, the armed forces were equally quick to innovate and fight under the severely constraining directive of not crossing the Line of Control. Today is a day to reflect. The nation must forever remain grateful to the young officers and soldiers under their command who braved all odds and launched what were virtually suicide missions to wrest control of India's lost territory and honour. Neither must we ever forget the lessons that the war has taught us. Alas, little seems to have changed on the ground. The armed forces continue to remain ill-equipped and ill-prepared and there has been little effective restructuring at the higher defence management level. There is much wisdom in the adage 'those who do not learn from history are condemned to repeat it'. Kargil was a serious wake-up call. It must always be remembered. In appointing State Information Commissioners, the Haryana Government followed high court directions of 2011 to advertise such posts and follow a laid-down selection process. Yet, as it turns out, one of the appointments is of a person already granted re-employment as adviser (health) to Chief Minister Hooda for his previous loyalty to him. Another is the wife of Hooda's political adviser, a person who has the CM's ear. The third beneficiary is the husband of a serving high court judge. If this is not nepotism, nothing is. The coincidence of only people close to the powers-that-be possessing merit is hard to digest. Such is the government's brazenness that it does not include even one name that may seem a fair selection. In defence, the government claims all procedures were followed. What actually happens is that the screening committee - comprising members of known allegiance - that shortlists applicants selects only people who the government wants to oblige. Even this list is not made public, and the procedure or criteria for making the final selections are not known. It is thus only a competition to see who is closer to the top from among the chosen ones. Fairness in the functioning of the statutory committee of three that makes the final selections - the CM, a minister, and the Leader of the Opposition - becomes impossible in practice when two of the three votes are of the government. This is what happens when people in high office betray the trust placed in them, necessitating court interference, and removal of all discretionary powers. The State Information Commission has come to be a crucial authority that is responsible for the fair implementation of the Right to Information Act, which holds the promise of fundamentally changing the meaning of transparency in governance. But placing people who know they are not there because of their merit undermines the position. Information commissioners are required to be people of eminence from diverse backgrounds. Here you see only the Chief Minister in the background. CAPT. Petavel has been at work in Calcutta and Bombay to demonstrate a new scheme of self-supporting education. That is to say each boy and girl is to receive a course of practical and useful education under arrangements which include an industrial scheme. This enables each pupil to pay his or her maintenance and cost of education right through and if possible leave a small reserve also to start life with. Although everyone is curious about this scheme and thinks it is too idealistic or utopian, there have been instances of success in the same direction reported from America. Several Indian students have been able to work for some time and earn wages sufficient to pay them for their course of education. And there are hundreds of American poor students who do the same more successfully. THE following Press communique has been issued by the Patiala Durbar regarding the case of two Arya Samajists which has attracted great attention all over India: "Various communications from different associations of the Arya Samaj have been received by His Highness the Maharaja as representations against the prosecution of two individuals in the State for indulging in grossly indecent and highly inflammatory remarks made in an open publication and calculated to wound the religious feelings of the Sikhs. To remove any misunderstanding the public and Arya Samajists in particular are informed that these are only proceedings of an ordinary nature against two individuals for their personal action and in no sense a prosecution of the Arya Samaj as such." Generally, Sikhs feel that the Haryana Sikh Gurdwara Management Committee (HSGMC) is a political rather than a religious issue. Whether it forms or not does not impact the wider Sikh community anymore than the Delhi Gurdwara Committee does. Sikh unity is neither strengthened nor weakened by the formation of new management bodies. It only affects the reach of the SGPC and its leadership. The SGPC is a regional body that has assumed greater powers and assumed greater importance than permitted by the Gurdwara Act 1925. What does affect the unity or disunity of the Sikhs is the conduct of the Jathedar and the method of anointment of a Jathedar. The Sikhs are united by Guru Granth Sahib, "rehat maryada" and the ability of the Akal Takht Jathedar to keep the diversity of Sikh opinions within one large family or the Panth. The views of Sikhs do not have to be the same. The principles they derive from, however, need to have similar foundations. For instance, the style of the turban can vary from a "Damala" to a "Patiala Shahi Dastar". But the principle of maintaining unshorn hair and covering the head with a form of "dastar" is not contested. And there are many other basic principles that Akal Takht's Jathedar has to ensure are maintained within limits of the principles agreed by the Panth. What the Jathedar does not have is the powers equivalent of the Catholic Pope. The Sikhs do not believe that he is endowed with special divine powers over others nor do they accept that supreme authority of sovereignty is vested in the Jathedar. That privilege is of the wider Panth guided by Guru Granth Sahib, the principle of Guru Granth-Guru Panth and expressed through Akal Takht. It is this which seems to be amiss in the current process of operation at Akal Takht. The appointment of the Jathedar is not arrived at by consensus of the worldwide Panth. He is installed there by the SGPC despite the fact that it has no legal authority to do so. In fact, the SGPC compromises the secular Constitution of India by enthroning a Jathedar. It needs to be appreciated that the SGPC is a management committee instituted under an Act of Parliament and therefore a statutory body of the state, bound by both the powers and the limits of the secular state. Under Article 26, the state can interfere in the secular aspects of a religion such as management of finances, appointments of office holders etc. However, the state cannot appoint someone to interpret religion, make religious decisions and so on. More than the SGPC, it is the Indian state that has to answer the question: Why has one of its statutory bodies gone beyond the permissible remit granted by the Constitution? 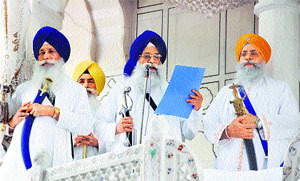 That the Sikhs have allowed the SGPC to appoint Jathedars without challenging its self-assumed role is another matter. The Gurdwara Act permits the SGPC to appoint the Head Granthi (minister) at Akal Takht but not the Jathedar, whose role in Sikhism is not as a minister or granthi. The issue at hand now is both about the way the Jathedar appears to be making decisions and the method of selecting the Jathedar. In any other institution with this extent of power, of being able to affect the very identity of a person, there is a due process necessitating a procedure through a series of steps. Even the President of India or the Chief Justice of India does not enjoy the arbitrary power that the Jathedar has assumed. The President cannot one morning decide without the advice of his/her Cabinet that someone is to be deprived of their citizenship and that the country is to divide or annex another one. There is a process. There are rules. There are advisers. There are legal requirements to be met. If the President dismisses all of these, it is unlikely that the President will remain in office for more than 24 hours. The Jathedar has to follow the principles laid down by the Gurus. The Jathedar has to justify his/her decisions to the Panth and those decisions need the widest support of the worldwide Sikh Panth. The SGPC is only one part of that Panth. There are Sikhs in other states of India and Sikhs across the world who have as much at stake as the SGPC and its immediate leadership in the office of the Jathedar. The edicts of Akal Takht affect Sikhs across the world. The SGPC at best represents the Sikhs in Punjab, not all of India, let alone the world. It is time that the process of decision-making at Akal Takht is institutionalised and a due process through a body of competent advisers is set up with the approval of worldwide Sikhs (not just SGPC). It is also time the process of selecting and enthroning a Jathedar was handed back to the worldwide Panth. An independent body selected across the world needs to take this in hand and call for a worldwide consensus on a figure. Then Akal Takht's Jathedar will command the respect of the entire Sikh community instead of having to shoot off threats of excommunications. It is ironic that the Sikhs were the first body of people in South Asia who had an institutionalised democratic process in the institution of Sarbat Khalsa, and the Sikhs are the ones who seemed to have permitted it to be abandoned. The principle of Sarbat Khalsa means consensus across the worldwide Sikh community through their representatives. It is a process that needs to be revived or these Jathedars imposed upon the Panth will cause further frictions within the community. The Sikhs can weather the setting up of a Haryana committee even if the Akali Dal may not, but they may not be able to remain united if decisions by the Jathedars are taken in secret and appear to be of arbitrary nature, giving suspicions of political bias. It is time the Government of India realised that one of its statutory bodies has exceeded the powers permissible under the Constitution. It is a violation of the Constitution. Since Prime Minister Narendra Modi is keen to have an ethical government, this is one of the abuses of office that can be rectified by the current government. Let the Sikhs, not the SGPC, decide who the Jathedar should be and what process of decision-making should be instituted. 1. Let us go to Macau with friends. We will really enjoy! The verb “enjoy” is almost always followed by an object in the form of a noun/ pronoun/ noun phrase. The sentence may be reworded as “We will really enjoy the holiday”. The verb “enjoy” is also frequently followed by reflexive pronouns like “ourselves”, the reflexive pronoun playing the object. Sentences like “He can't express” or “You must introduce” reflect similar concerns, as both “express” and “introduce” need objects here. Certain exceptions exist. For instance, the friendly imperative “Enjoy!” Occasionally, creative writers too take the liberty of dropping the object after a verb such as this. 2. The Hostel Warden assured that she will allot the rooms. 3. The feminists deplored that women were being denied the right to vote. 4. I would appreciate if you could get me some pearls from Hyderabad. The sentence needs “it” soon after the verb “appreciate”. The object “it”, an empty word, meets a syntactic requirement with practically no semantic role to play. The use of “appreciate” in such contexts conveys politeness while exuding an air of formality to the sentiment expressed. When “appreciate” shows the increasing value of money or property, it acts as an intransitive verb. How transitivity of different verbs works and what all can follow a verb together constitute a critical area of usage. Learners can do well by concentrating on it. Breaking all previous records, the Bang Bang teaser has clocked 2.33 million views in just 24 hours! It's a new record that has never been achieved by any Bollywood film ever. Fox Star Studios gets Notting Hill editor Nick Moore to make a cut for Finding Fanny for non-diaspora markets. This is for the first time that an Indian film will have such a wide release. Reality TV star Nicole Polizzi, popular as Snooki, celebrated her upcoming nuptials to fiancÃ© Jionni LaValle with bridal shower themed on The Great Gatsby. But yes, if in your heart lives dear Salman, the superstar, you will root for this Devi Lal Singh-turned-devil with full gusto. If not, you will go looking for flaws that are only expected in a masala entertainer that follows in the grand tradition of many a film spun from the same yarn. So here he is dear Sallu Bhai as Devi Lal Singh, all brawn and heart, who gets his kick from doing things out of the ordinary, a reason why he can't hold a regular nine to five job. Instead, he goes around helping a friend elope with his beloved, flexing his muscles, doing high octane action, getting crazy drunk with Father Dearest (Mithun Chakraborhty) and romancing with beautiful damsel Shayna (Jacqueline Fernandez). And whatever he does is all for a good cause of course. For beneath his bone-breaking antics rests a heart of gold. Familiar ground… you bet. Only before you can truly fathom his quirky idiosyncrasies and why he, a bright engineer, can't find a job that would give him his dose of adrenaline rush, he turns a new leaf. Lo and behold, he is now Devil, the master of daredevil heists. Now, he has our attention. More so, for on his tail is handsome actor Randeep Hooda as the police officer, Himanshu. Together they have some moments that rock. The cat and mouse game between the two could have been the bedrock of the narrative and could have lifted the film to another level. But in a Khan film that rides on his charisma and superstar status, it can't be the only pivot. For the right to dominate belongs to Salman and Salman alone. Expectedly, Randeep Hooda gets short shrift and can't be the supercop he deserves to be. Nonetheless, in his long cameo of an intelligent officer albeit two steps behind the superhero he is as always competent and stylish. Gifted actor Nawazuddin Siddiqui who has given us many fascinating shades of characters, including grey, in various films turns black with glee, literally and metaphorically. With his Machiavellian ways and cunning laughter honed dramatically , he is the perfect counter devil incarnate who revels in his shaitainiyat. Not surprising, he impresses in his brief appearance. And surprise of all surprises Jacqueline Fernandez who looks fetching has a meaty part, even though the love tale is not the real focus here. Salman is well Salman, endearing and dominating each frame as only he can. Striding the film like a colossus, lending it the right push he and the script don't let us forget who he is. Thanks to him and some apt direction by Sajid Nadiadwala, the three hour drama doesn't become tiresome. Despite most clichés of Hindi cinema being trotted out the ride is worth its while. Headache might be Shayna's nickname for Salman's character; the film certainly doesn't give you one. Will you reel under a hangover? Well, well, in case you were snoozing while the news about Sallu singing for Kick was making headlines, savour his well-tuned voice. The song Hangover proves he can sing, if not as well as he packs a punch but good enough for you to tune in. As for tuning in to his film, logic be damned, if you get your kick by watching a Salman Khan film you won't be disappointed. He gives you enough reasons to get kicked. And with whimsical director Wes Anderson in charge, one can expect the unusual. For one thing, form rises over content but his clever treatment with quick cutting and editing, plus the right ambience, makes it even more desirable. Credibility is non-existent but one soon learns to live with it. There are also a number of tongue-in-cheek dialogues. That it is based on the writings of the noted Stefan Zweig, whose Beware of Pity is a masterpiece, further enhances its worth. It all begins with a young girl visiting a statue of The Author in a cemetery in Zubrowka and reading from his novel. Cut to the Grand Budapest Hotel where the same author (Tom Wilkinson) sitting in the lobby watches an old man sitting quietly in a corner. On enquiry, he learns it is the former Lobby Boy (F Murray Abraham) who later invites him for a meal, a long one, so he can narrate his colourful story. It revolves around its suave concierge Gustave H (Ralph Fiennes), who when not performing his regular duties courts a series of wealthy old women and keeps them happy. One such is Madame Celine Vileneuve, known as Madame D (Tilda Swinton), who feeling insecure wants him to accompany her but after he refuses, the next day news of her murder surfaces. So, taking his lobby boy Zero (Tony Revolon), they rush to Madame Ds residence where the body is laid out and a horde of relatives are in waiting. Soon, Gustave is charged with murder and Madame D's son Dmitri (Adrian Broody) doesn't disguise his hatred for Gustave. What's more Madame D has willed a priceless painting Boy with Apple for Guistave. Deputy Vilmer Kowacs (Jeff Goldblum) is made the executor of the will, but he too is soon killed. There is talk of a second will, but meanwhile Gustave and Zero escape with the painting. Actually, it is the bond between these two that is the meat of the film. The dialogue is witty and Gustave's liberal use of Bs and Fs gives it zing. So do some of his amorous anecdotes told to an aghast Zero! They are neck-deep in trouble and this involves Gustave going to prison but escaping in an unlikely way with the help of Zero's girl-friend Agatha (Saoirse Ronan), who supplies cakes to the inmates. They are attacked by Joplin (Jeff Goldbum) but they decide to nab him. A chase in the wintry snow provides thrills as does the train rides as Joplin meets his death. By now the action is secondary; it is the depiction that is important. Cinematographer Robert Yoeman shows his skill and Barney Pilling's editing is terse. The ending is expected though one has a close look at F Murray Abraham, the star of Amadeus nearly two decades ago. Scarcely recognisable, Ralph Fiennes is brilliant in the lead and is ably supported by the young Tony Revolon. There are a host of big names in cameos that flit in an out like Adrian Broody, Willem Dafoe, Jeff Goldblum and veteran Tilda Swinton makes a good corpse. Housefull 2 is an Indian comedy film directed by Sajid Khan and produced by Sajid Nadiadwala. It is the sequel to the 2010 film, Housefull and stars Akshay Kumar, Asin Thottumkal, John Abraham, Jacqueline Fernandez in lead roles. Queen is a comedy-drama film.Directed by Vikas Bahl, the film stars Kangana Ranaut, Lisa Haydon and Rajkummar Rao in lead roles. The film's story is about a naive middleclass girl in Delhi.